Residents of villages in the Heilongjiang province of China reported three UFOs fell from the sky on Friday morning, according to the China News Service. 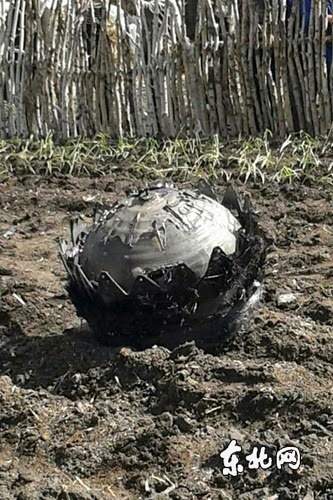 The circular, metallic objects crashed to the ground of two counties after “villagers heard…a huge piercing sound, and then some villagers saw a big fireball” that eventually fell in a vegetable garden owned by one of the residents. The object pictured in this story is reported to be “about 2-and-a-half-feet wide and weighing nearly 90 pounds,” according to OpenMinds.TV. While investigators arrived on the scene of the vegetable garden to examine the object, stories began to emerge, offering a possible explanation for all the excitement. According to Ecns.cn, the official English-language website of China News Service, just before the Chinese village residents witnessed unidentified flying objects in the sky above them, a Russian Proton-M rocket — carrying a communications satellite — experienced engine failure shortly after its launch Friday morning, burning up in Earth’s atmosphere. While Russia maintains their rocket mostly disintegrated above Earth, China media suggests some unburned portions of the rocket accounts for those objects that crashed in the ground. The investigation in China is ongoing.